In January, a 6-year-old boy was killed by a loose pit bull. Amy Soeldner wants that to never happen again. January 17 was a peaceful Tuesday morning in southwest Atlanta. At 7:30 a.m., kids were walking to the bus stop, ready to start a new school day. Two dogs loose in the neighborhood, a pit bull mix and a border collie, attacked two children walking along Gideons Drive. The aftermath was grisly—a 6-year-old boy, Logan Braatz, lay in a front yard, covered in blood, while a 5-year-old girl, Syari Sanders, had her face mauled and disfigured. Other children were cornered and tried to shield themselves as neighbors ran outside, some with guns, at the sound of screaming. Braatz was taken to Grady Memorial Hospital’s trauma unit, according to the Atlanta Journal-Constitution, where he later died due to his injuries. Sanders survived. Fulton County Animal Control captured one dog while an officer shot and killed the other. The dogs’ owner, Cameron Tucker, was eventually charged with manslaughter. Incidents like these led the Atlanta Police Department to change the way it handles animals and irresponsible pet owners. 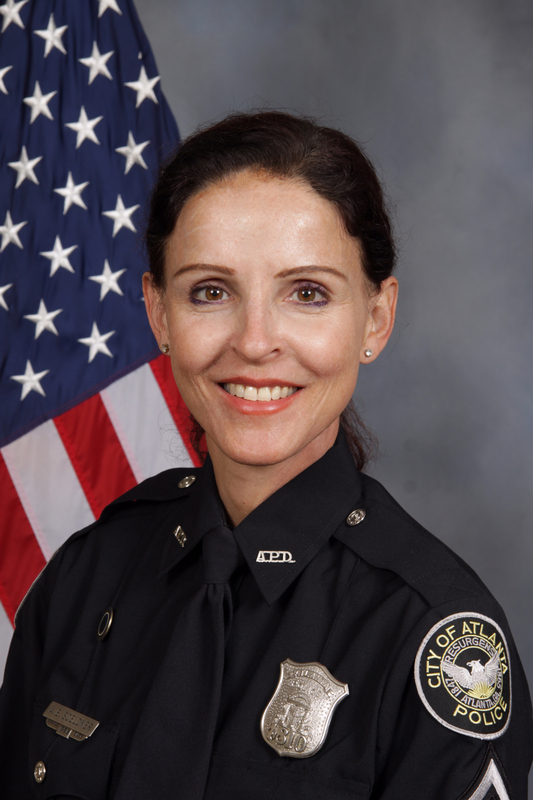 APD recently created a new sworn position, Animal Cruelty Liaison Officer, with senior police officer Amy Soeldner the first to take the helm. Soeldner, a 22-year APD veteran, is known for her expertise and compassion with animals. She’s trained fellow officers on how to handle animal cruelty, which, over a three-year period, reduced the number of officer-related dog shootings from 28 shootings and four killings to 15 shootings and zero killings. Soeldner even created a state Peace Officer Standards and Training Council-certified course that teaches officers how to properly handle animal encounters. 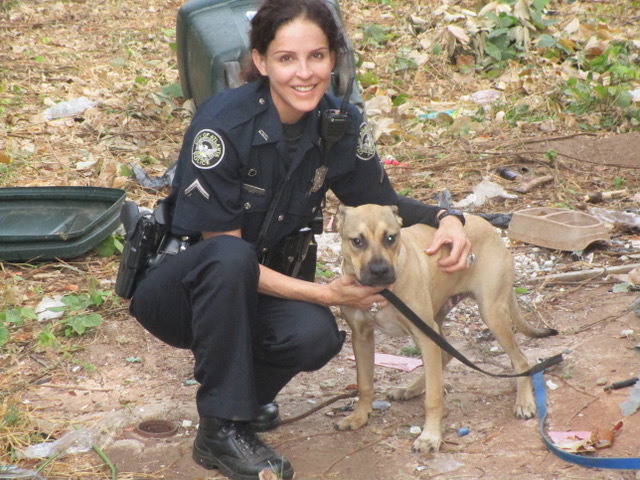 We recently spoke to Soeldner about how her new role will protect Atlanta communities and improve officer relations with animals. I’ve always liked animals. We had them growing up, but I didn’t have the passion until I came across [a dog] in a box on the side of a tire shop—an alarm call in the middle of the night. I didn’t want a dog, and I loved my life [at the time]—fancy-free, could come and go when I wanted to. But when I picked her up, she had a broken leg. I put all my overtime in that leg, got a plate in there, and she lived to be 16. She the one that really set it off. She was the reason why I wrote the [training course], actually. Why does Atlanta need an animal cruelty officer now? What kind of spurred this position was the January incident with the pit bulls. It was not the first time those animals were reported running loose in the city. And we’re very concerned about that because in some parts of the city, we have a crime problem with animals running loose. We’ve got people that walk their own dogs while carrying sticks or mace. We’ve got elderly people who call because they cannot get out of their cars when they pull into their driveways because a dog is at their driver’s side door or on their front porch. A lot of these owners are extremely irresponsible and those animals can harm children that are walking to these bus stops, elderly that are trying to [get home], and these folks don’t have a real voice for them. We want to draw attention to this issue so that we can start getting the problem of loose animals, and possibly aggressive ones, down to the minimum instead of what’s going on right now, which is kind of an epidemic. Why wasn’t this position made earlier? I don’t think that the city was ready to recognize that we had such a problem. I think we were, rightfully so, focused on so many different problems. And then as the city grew and more people started moving here, I think the awareness was really heightened. What happened that led to the decision to create your position? Over the years the department started to recognize that they’d give me a ring whenever something animal-related was up. About a year ago, we got together with [District 1] Councilwoman Carla Smith to talk about getting an animal cruelty task force together. She was contacted by W-Underdogs, which is a nonprofit that works with to keep kids out of gangs by having them work with animals. [Smith] was starting to see that there was a correlation between keeping some of these kids off the streets and out of gangs and having them develop empathy toward animals. These kids grew up seeing animals chained or beat or neglected [until that became] commonplace. They didn’t know any other way. What will you be doing with your new position? I’m going to investigate any kind of cases of animal cruelty. I’ll work with Fulton County Animal Control, I’ve got the other officers on the street, and I have my own telephone number now specifically for cruelty cases. I’ll go to Neighborhood Planning Unit (NPU) meetings and talk with different organizations, especially in some of the underserved areas where there is a tremendous problem with loose animals and animal cruelty. I want to continue to educate officers on using nonlethal methods on animals. And I also want to educate them and the public about the link between animal cruelty as a precursor to more violent crimes such as domestic violence or school shootings. If someone abuses an animal and they’re not punished or caught or redirected, it emboldens them to go onto other crimes. I want to really ramp up exposure [of this position] to the community so they know that there is someone to reach out to and who can get results for them. [Right now] if people see [an animal cruelty incident] in the community, they might call animal control, but our animal control is seriously underfunded and overburdened. It’s a huge position; I won’t lie about it. It’s kind of mind-boggling at this point, but we’re taking baby steps, and we’re going to build it on a strong foundation. What does this position show about Atlanta’s commitment to animal safety? We’re really hoping that this position sends a strong message that Atlanta cares about not only the animals, but their community, their people. It’s not just about the animals, it’s all intertwined. We want our citizens to feel safe, we want our kids to feel safe going to the bus stops, and we want to go after these irresponsible owners.